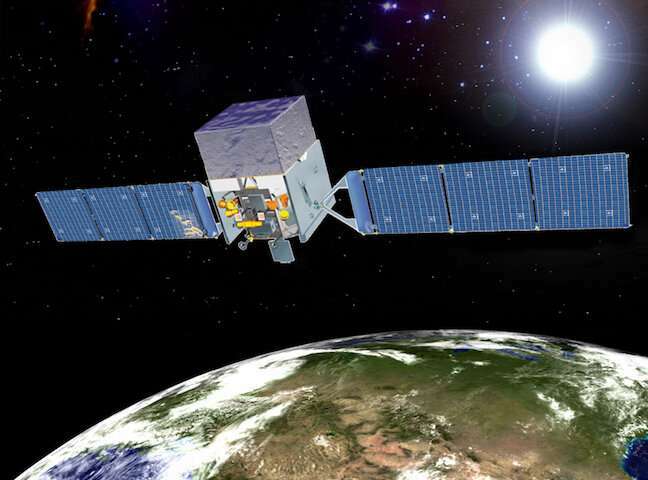 An artist's conception of the Fermi Gamma-Ray Astronomy spacecraft in orbit. Astronomers using infrared observations to help identify Fermi blazar sources amongst the many candidates in a Fermi field-of-view have published two new catalogs of gamma-ray blazars. NASA's Fermi Gamma Ray Astronomy satellite, launched in 2008, has detected many bright gamma-ray sources, but determining what they are and if any are blazars is difficult because Fermi's resolution on the sky is only about the size of a quarter full moon, and that large area of sky typically contains many sources that could be emitting in the gamma-rays. Moreover, blazars are notoriously variable at high energies and their irregular flickering can make them difficult to pinpoint exactly. Extensive observations of possible candidates with optical or other facilities can be successful but are very time consuming. A team of astronomers including CfA astronomers Raffaele D'Abrusco and Howard Smith found that the infrared colors of blazars are generally unique because the emission, rather than from hot dust as is typical, is instead coming from processes associated with the blazar jets. They used color data from the Wide-field Infrared Survey Explorer (WISE) in conjunction with catalogs of radio source to identify the most promising gamma-ray candidate objects in the Fermi survey and for the past several years have followed them up, with a success rate confirming blazars of about 90 percent.